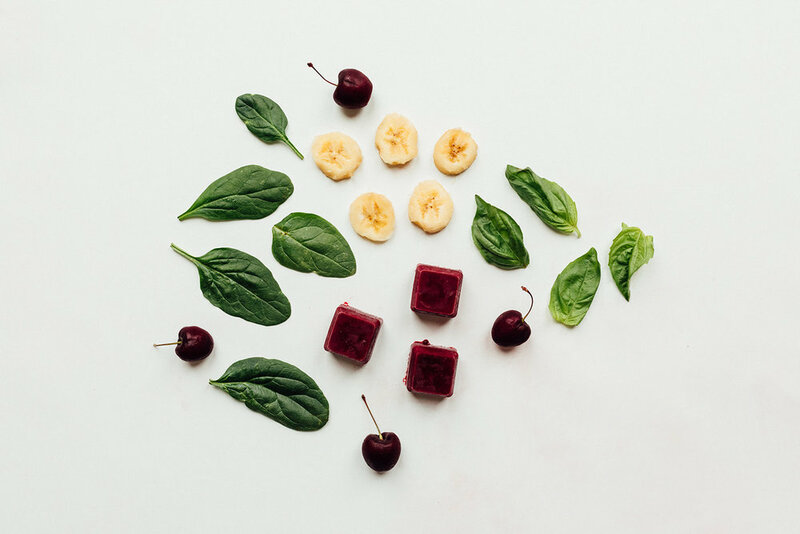 Each Bumpin Blends subscription is fully customizable based on taste preference, dietary restrictions, and food aversions. To edit your blends or request a blend, simply text your nutritionist hotline. If you have certain dietary restrictions, let your nutritionist know and we will make custom blends to meet your needs. Please reach out if you have any other questions about our blends! Don't let the babe cramp your style. Give your body what it needs with this smoothie, packed full of ingredients like bananas and pumpkin seeds for a boost of potassium and magnesium. This makes a deeelish dessert and is quite filling - best to split into two portions. Nutritionist's favorite liquid to blend with: almond milk! This green machine is jam-packed with all the nutrients a super-mom needs to go from tired to wired! It helps increase energy levels while incorporating necessary nutrients to fuel you and your babe. Drink with plenty of water, ideally for breakfast or a mid-day boost. Nutritionist's favorite liquid to blend it with: coconut water! Feeling anxious? Relax the mind and body with this superfood smoothie, with ingredients to balance blood sugars and energy. Set aside some time to enjoy this blend in peace and quiet, you deserve it mama. Nutritionist's favorite liquid to blend it with: almond milk! Can't sleep? We got you. With ingredients like dark cherries as a natural source of melatonin, insomnia has nothing on you. Sip 1-2 hours before bed. Nutritionist's favorite liquid to blend with: coconut water or dark cherry juice to give it an even richer flavor! Cookie dough cravings? This smoothie will satisfy…as long as you can drink it before someone else steals it. This fan favorite will keep the whole family happy, and one “serving” will likely serve 2-3 due to it’s sweetness and rich flavor. Enjoy as dessert and share with the fam! Nutritionist's favorite liquid: almond milk. To make it more like cookie dough, add less liquid. With hormone-balancing peaches and walnuts, this smoothie is perfect for that extra umph to balance out your mood. Nutritionist's favorite liquid to blend with: almond milk! Feeling green? This soothing smoothie has ginger and honey to support your nausea and digestion, oats to help balance your blood sugar, and coconut water to help rehydrate you. Plus, it tastes like cookies, so you’re welcome. If you are a victim of classic morning sickness, try drinking only a few sips of this blend at a time and spread it out over a few hours. Nutritionist's favorite liquid to blend it with: almond milk! 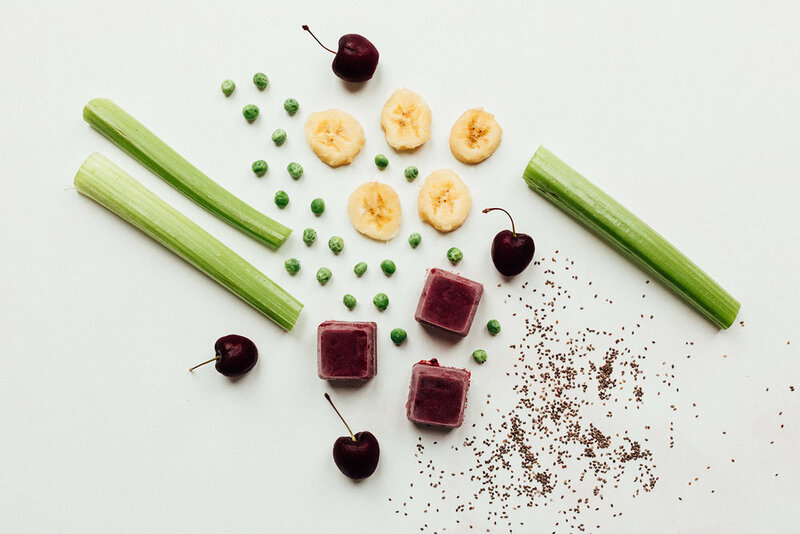 Say buh-bye to swollen ankles with this sweet smoothie that has cherries and celery to fight off that inflammation and help shed excess water weight. Nutritionist's favorite liquid to blend it with: coconut water! Other ideas to reduce swelling: drink extra electrolyte-rich fluids, like coconut water, and spend 5-10 minutes every few hours elevating your legs (or sleep with a pillow under your feet!). Compression socks are also a mama's best friend. Got baby bloat? Packed with ginger, cucumber, and watermelon, this blend is the perfect snack for a momma who needs to de-bloat. It is anti-inflammatory and full of vitamins and electrolytes. Nutritionist's favorite liquid to blend it with: coconut water! If you're craving a kick, try adding a bit of jalapeno or spice to this blend. Feeling moody? We got you. This smoothie tastes like Cinnamon Toast Crunch and will elevate your mood at the same time. Win, win. Nutritionist's favorite liquid to blend it with: almond milk! 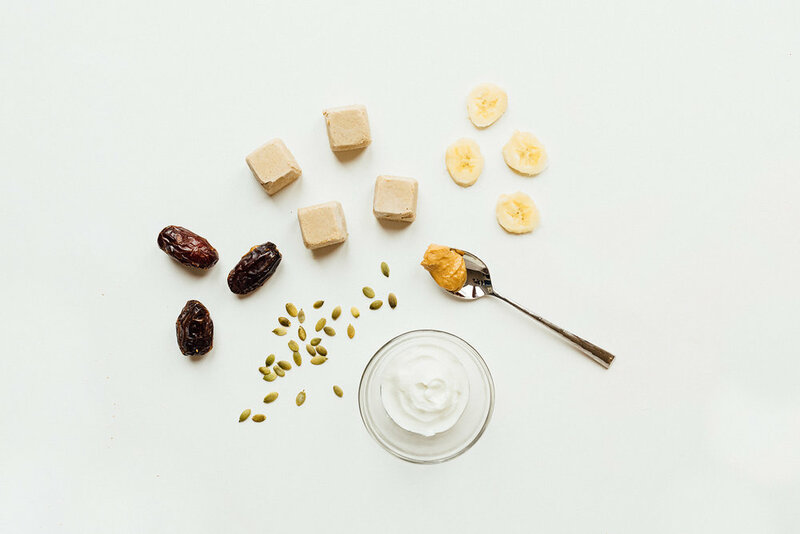 End the heartburn and indulge in this nutrient dense smoothie that tastes like a PB&J! Hide this from the kiddos if you want to finish it yourself! Nutritionist's favorite liquid to blend it with: almond milk. Sit back and relax (those muscles) with our dark chocolate peanut butter smoothie. This one tastes sinful (and is a dessert!) but is a great nutrient source for you + your babe, and has no added sugar! This is a very rich, decadent blend - it will likely last 2-4 servings! Nutritionist's favorite liquid to blend it with: almond milk. Sit back and relax as this tropical smoothie transports you to paradise and that nagging heartburn melts away. Adding extra ice to the blender makes a great slushie. 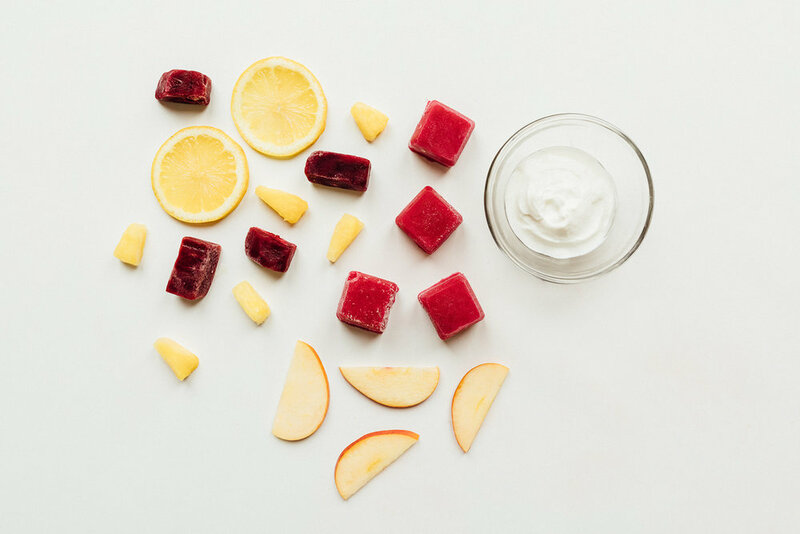 Or, blend and freeze into popsicles for a refreshing treat. Nutritionist's favorite liquid to blend it with: coconut water! Beans, beans...this smoothie is jam-packed with the musical fruit to give you the “relief” you've been looking for. Drink this with at least one full glass of water (for an extra boost, make that warm water with lemon!). Nutritionist's favorite liquid to blend it with: almond milk! Need an energy boost? This blend keeps you nourished and energized even on your busiest days. Nutritionist's favorite liquid to blend it with: coconut water! This blend is packed with iron, making it the perfect supplement to a momma with anemia or low iron. It’s also super delicious, so I mean, win win. Often, iron is constipating and poorly absorbed, so we paired it with mango (rich in vitamin C) to boost absorption and support digestion. Our recommendation: mix dark leafy greens with citrus fruits to help increase your iron levels naturally. Nutritionist's favorite liquid to blend this with: coconut water! The secret ingredient in this smoothie is beets, which are full of nitric oxide to reducing swelling. Having too much pineapple in your first or third trimester is not advised, but have no fear: this blend falls far below the recommended amount. Nutritionist's favorite liquid to blend it with: coconut water! Hydrate with our fruity superfood smoothie, sure to decrease swelling and provide you with a hearty dose of fiber. Mint chip ice cream isn't just for the kiddos. 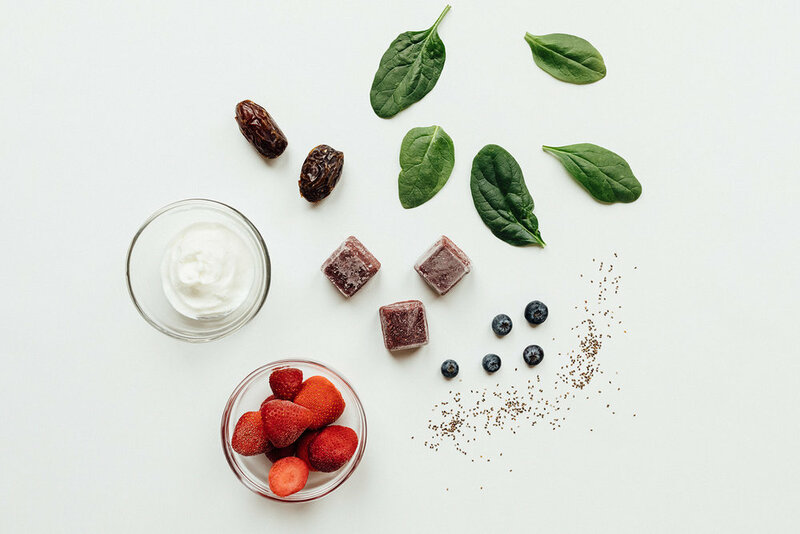 This smoothie is mom-approved with ingredients like spinach and greek yogurt to fuel your body while satisfying that sweet tooth. This blend is meant to be enjoyed over 2-4 servings and is rich enough to be dessert! Nutritionist's favorite liquid to blend it with: almond milk! Suffering from mom-acne? Wondering where your pregnancy glow is at? We’ve been there. This blend is full of vitamins and antioxidants to give your skin the glow it needs. Other methods we love to "get the glow" include increasing your water intake and adding some extra moisturizer at night. Nutritionist's favorite liquid to blend it with: coconut water! Nutritionist's favorite liquid to blend it with: coconut water! FUN FACT: making this blend is what launched the idea to create Bumpin Blends - our founder made it daily to keep her digestion in check! The perfect aid for when you need just a little extra help in the ladies room…a fiber-packed blend you won’t be able to live without.